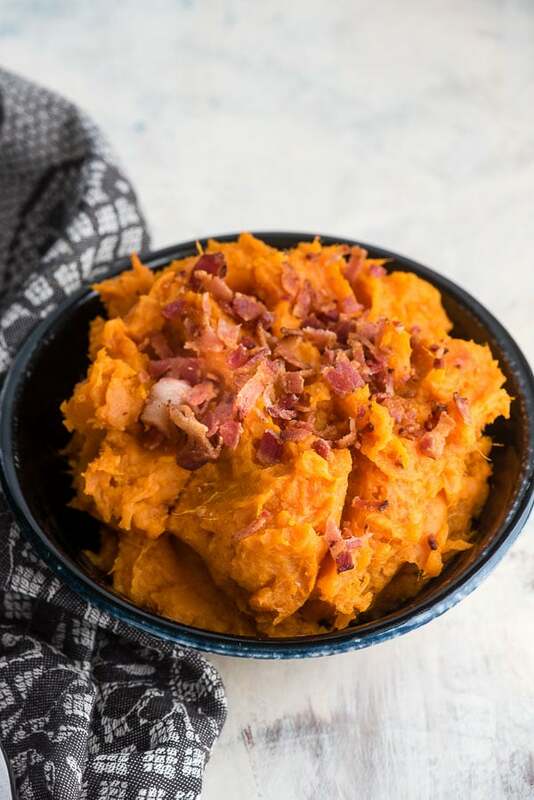 Instant Pot Mashed Chipotle Sweet Potatoes with bacon are sweet, smoky, salty and spicy with a creamy texture. They cook in 8 minutes in the Instant Pot, are mashed and kept warm in the Instant Pot too making them a great option for a fast, exciting side dish any time and for holiday meals when kitchen space is at a premium! 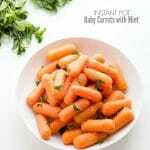 (Similar traditional recipe link included too for those without an Instant Pot). If a few years ago someone told me I’d be excitedly sharing a sweet potato recipe with you I would have scoffed. Ruined by too many childhood meals with overly sweetened yams (which by the way I would refer to as ‘orange juice potatoes’ sure they were regular potatoes sweetened with OJ), I really couldn’t stomach them. Tempted by their nutrition and hope, I found a secret that has turned my sweet potato phobia around. Instant Pot Mashed Chipotle Sweet Potatoes are magical. The secret is the addition of adobo sauce, the smoky, spicy sauce found with chipotle peppers in chipotle en adobo. 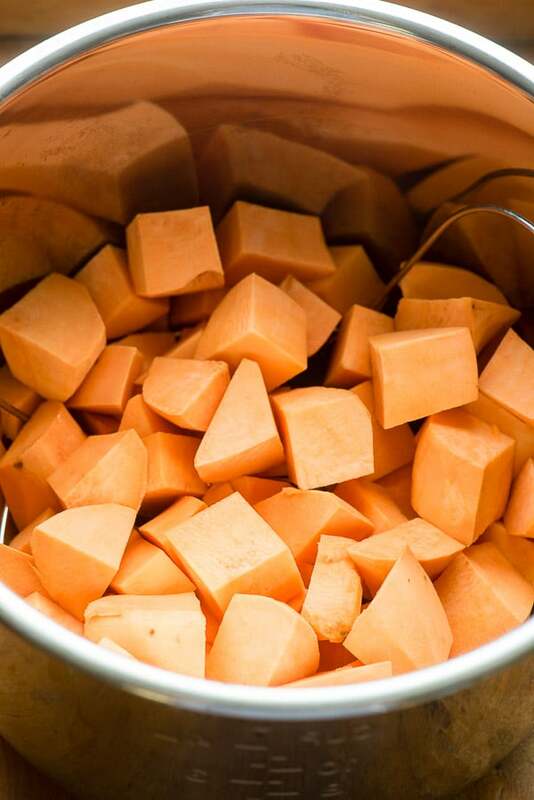 The natural sweetness of the sweet potatoes are contrasted and complimented with a bit of heat and smoky flavors. For those without an Instant Pot, Chipotle Sweet Potatoes Gratin is a similar recipe baked in the oven that would be great to try! 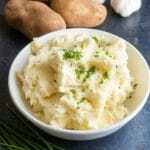 Pressure cooking is perfect for mashed potatoes. 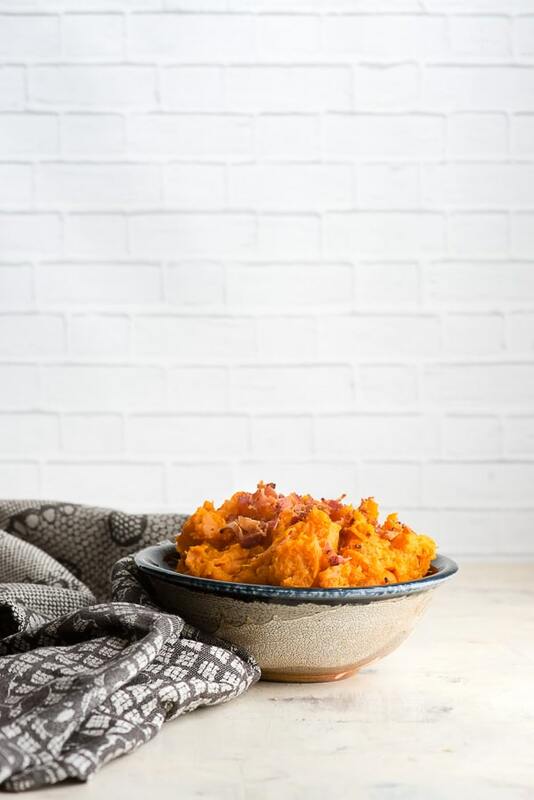 Instant Pot Mashed Chipotle Sweet Potatoes are a breeze to prepare. Not only does the cooking method make the recipe at lightning speed, pressure cooking retains food nutrients that can be lost in traditional cooking methods. After pressure cooking for 8 minutes the potatoes are drained and returned to the Instant Pot insert to mash with some butter and adobo sauce to keep warm. I love this for big dinners or holiday meals when oven and stovetop space is at a premium (think Thanksgiving and Christmas meals). They retain nutrients as well that can be lost in traditional cooking methods. The finishing touch of crumbled bacon pulls all the goodness of this recipe together. The trinity of sweet, spicy and salty (with a bit of smoky too) really elevates these mashers to a fantastic side dish great for roasts, or roasted meats or poultry. It’s an unexpected flavor combination that will warm your cold weather dinner table….with little effort and in about 30 minutes. 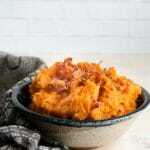 Sweet, smoky mashed sweet potatoes are irresistible with a bit of spice too. Fast and easy in the Instant Pot. Put the sweet potato cubes in the Instant Pot trivet along with the water. Close, ensure vent is sealed and program for 8 minutes on High Pressure. When complete, do a quick release and drain contents using a colander. Keeping the Instant Pot on Warm (the default setting after cooking) add the butter to the Instant Pot insert to melt. Stir in the adobo sauce and return the drained sweet potatoes to the instant pot. Using a potato masher, mash the potatoes and stir to combine the butter and sauce. Salt to taste and serve warm. The potatoes may be left in the Instant Pot on warm until serving. I keep meaning to get an instant pot. I hear such great things. This recipe looks amazing! I don’t even like sweet potatoes, but I want to try this! It looks delicious. This looks so delicious! I am always looking for new recipes to try out for Thanksgiving, and I think this would be perfect. I will have to give this a try! You just won over my heart I love Sweet Potatoes! I’m going to try this recipe for Sunday dinner. I’ve lived for almost 38 years and finally had my first sweet potato last year. How did that happen? I love them now and get excited to try new recipes featuring them. This one sounds like one I would gobble right up! I definitely agree that the crumble of bacon adds the perfect final touch. This looks delicious and is a winner for Thanksgiving! This looks super delicious! I so need to make this at home! I have never thought of making mashed chipotle sweet potatoes before. They sound delicious. I should go ahead and change up the menu this coming Thanksgiving and do mashed sweet potatoes instead of mashed potatoes. 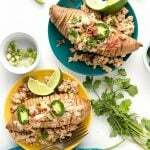 I’m sure it’s going to be a hit, especially with the flavors from this recipe! YUM! I would love to try and make this for Thanksgiving. I love mashed sweet potatoes because they’re so much healthier than your usual mashed potatoes. I love the idea of adding adobo sauce. I am currently in love with sweet potatoes. These sound absolutely perfect. That flavor combo, wow! Okay, this is a game changer for me! I have never tried putting sweet potatoes and chipotle together but it makes complete sense! I’m sure this tastes amazing! And this is coming from a long term sweet potato resister! You’ll love them; trust me! These look like they would taste absolutely amazing. I need to give them a try! Your post is beautiful in aesthetic for starters. Second, my wife loves chipotle and this is going to be something I share with her. I bet I could try it with regular white potatoes, too, right? Bookmarking for the holidays now. Yummy! Thank you Carol! Your comment made my day! 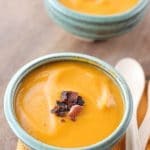 I personally think what makes this recipe special is the contrast of the sweetness from the sweet potatoes and the smoky, spicy flavor of the chipotle. BUT having said that you absolutely can try it with regular potatoes! I love chipotle and pretty much anything and think they’d elevate white mashed potatoes too…..and who doesn’t love bacon crumbles?! Ok, now this looks amazing! I would love to add this to my Thanksgiving meal plan. I love sweet potatoes. These look delicious. I am always looking for new recipes to make in my Instant Pot. 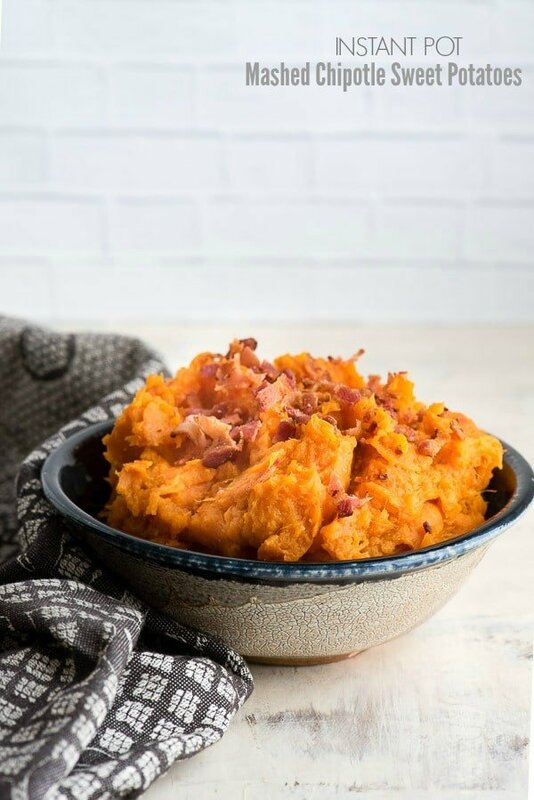 These Mashed Chipotle Sweet Potatoes with bacon are sure to be a big hit in my house. I will have to add this recipe to my meal plan for next week. This is such a cool sweet potato recipe. The bacon and spiciness sounds really good! You had me a Sweet Potatoe! THis would be a great recipe for Thanksgiving. Will include on our menu. Thank you. I’ve been hearing nothing but great things about the Instant pot. I really want to get myself one now because this recipe looks and sounds awesome!!! Thanks for sharing! Now that sounds heavenly! I love chipotle and I’ve never thought about putting it into the potatoes. I have an instant pot so this will be a perfect side when I make dinner tonight. Ohhh, chipotle and sweet potatoes together? Sounds delicious! I have an instant pot but I’ve never used it. Might be time to break it out! That looks so good! I’ve been using sweet potatoes in place of russet potatoes for a little while now, and it’s great! They’re so much healthier, and they have so much more flavor. Time to bust out my Instant Pot! Wow, I am super excited to hear about these! I am adding them to my Thanksgiving menu right now. Yum…..